WARNING! This is the official and only website for the Journal of Evidence-Based Psychotherapies (JEBP). The journal was formerly known as Journal of Cognitive and Behavioral Psychotherapies (JCBP) and changed name to Journal of Evidence-Based Psychotherapies in 2014. From that date on, JCBP ceased to exist under that name and any website claiming to represent it is a fraud. Publication in JEBP is subject to peer review. Accepted articles are published for free. JEBP has never asked for publication charges, neither has its predecessor JCBP. Any website asking for publication fees in the name of JEBP or JCBP is fraudulent. There are no other published articles except for those listed on the website, which have also appeared in the print edition. We only list articles on the website after their appearance in print. There is no online first option for JEBP. Please alert the editor directly (Ioana Cristea: ioanacristea@psychology.ro) if you believe you might have been the victim of another individual or entity claiming to represent JEBP. I. Journal of Evidence-Based Psychotherapies, ISSN 2360 – 0853, is the successor of the Journal of Cognitive and Behavioral Psychotherapies (2001-2013) and is published biannually (in March and September) in one volume per year by the Cluj-Napoca University Press of Babeș-Bolyai (Presa Universitară Clujeană), being associated with the International Institute for the Advanced Studies of Psychotherapy and Applied Mental Health. 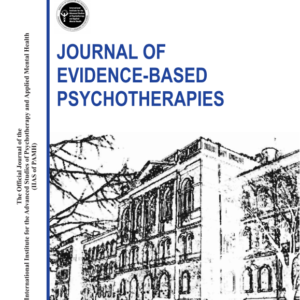 The journal is devoted to the advancement of the clinical theory and practice of evidence-based psychotherapies (EBP) (e.g., evidence-based psychological assessments, evidence-based psychological treatments). The journal publishes original papers dealing with EBP and psychology, psychiatry, the medical and mental specialties, and allied areas of science. Submissions include (1) articles referring to clinical and experimental studies, discussions of theory, and systematic reviews for inclusion in Article Section, (2) articles referring to clinical discussions/developments for inclusion in the Clinical Forum Section, and (3) commentaries, letters to the editor, reviews and abstracts of books, tapes, and films, salient findings in EBP, and other information relevant to the journal’s goal for inclusion in the Development and Resources Section. Finally, the journal seeks to publish special issues devoted to topics of particular interest, suggestions for which are welcomed by the Editor. Bibliography of Social Science; (2) Full text: EBSCO and ProQuest. Journal of Evidence-Based Psychotherapies (JEBP) is the formal continuator of the Journal of Cognitive and Behavioral Psychotherapies (JCBP) (2001-2013) that was the official publication of the International Institute for the Advanced Studies of Psychotherapy and Applied Mental Health. A part of the JCBP (and its board) – more classical cognitive-behavioral therapy oriented – merged in 2013 with the Journal of Rational-Emotive and Cognitive-Behavior Therapy (published by Springer). The International Institute for the Advanced Study of Psychotherapy and Applied Mental Health has decided to change the name of the Journal of Cognitive and Behavioral Psychotherapies into the Journal of Evidence-Based Psychotherapies to better reflect the evolution of the field of clinical psychology and psychotherapy, including the evolution of cognitive-behavioral therapy (CBT). Indeed, although CBT remains the prototype of an evidence-based psychotherapy, other psychotherapy approaches started to adhere and/or be included in the evidence-based paradigm. Moreover, CBT today is very diverse and therefore the new Journal aims to be inclusive of all CBT approaches: not only the classical “waves” (i.e., behavior and cognitive-behavioral therapies), but also the new third “wave” CBT (i.e., acceptance and mindfulness-based therapies). Thus, the new name of the Journal is more suited to reflect the dynamism and the state of the art in the field of psychotherapy. It will continue to promote the Eastern/Central European activity in the field at an international level, but with an explicitly open and encouraging attitude for publications all over the world (indeed, more than 60% of the former international publications of the JCBP came from western Europe, USA, Asia etc.). Journal of Evidence-Based Psychotherapies (JEBP) will have almost the same board as JCBP and will be published by the same publisher (PsyTech). Moreover, it will remain the official publication of the International Institute for the Advanced Studies of Psychotherapy and Applied Mental Health, but will be also assumed by the Romanian Association of Cognitive and Behavioral Psychotherapies (a member of the European Association of Behavioral and Cognitive Therapies) to better increase its visibility and impact. We believe that with this new name, based on the same committed team and scientific environment, the Journal of Evidence-Based Psychotherapies (JEBP) will increase its visibility and impact in the psychotherapy community worldwide.